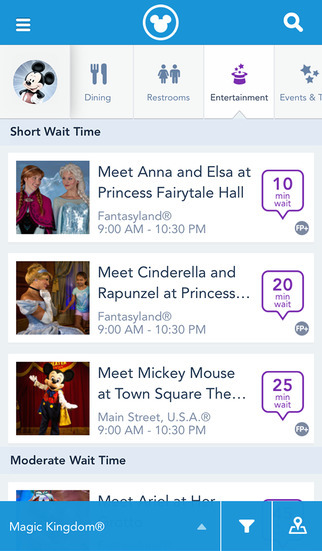 •	Quickly access real-time wait times, park hours, Character greetings, parade showtimes and more. 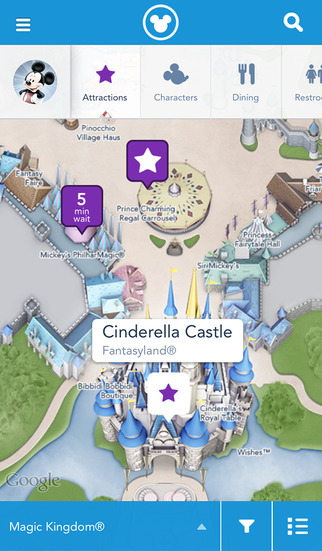 •	Use the interactive, GPS-enabled map to explore Walt Disney World Resort and easily see the dining options, attractions and more nearest to you. •	Browse restaurant menus and make dining reservations. 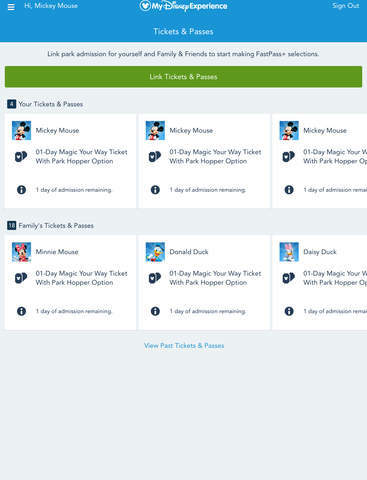 •	Select and modify your party’s FastPass+ experiences. •	Search, sort and filter activities by height requirements, distance, wait times and more to find exactly what you’re looking for. •	Keep reservations and activities organized in My Plans, located right on your iPhone home screen. 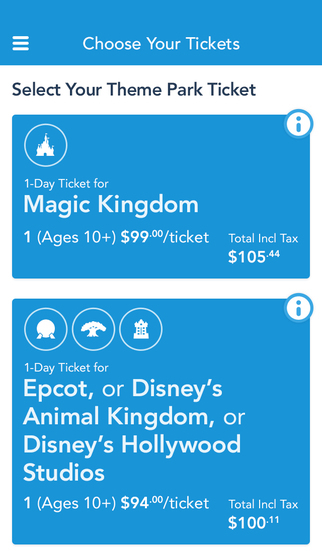 •	Manage your Disney Resort reservations, tickets, MagicBands and cards. •	Share plans with others through Family & Friends. •	Discover official content for Walt Disney World Resort, including our 4 theme parks (Magic Kingdom® park, Epcot®, Disney’s Hollywood Studios® and Disney’s Animal Kingdom® park), 2 water parks (Disney’s Typhoon Lagoon and Disney’s Blizzard Beach), Downtown Disney® area, select Walt Disney World Resort hotels and ESPN Wide World of Sports Complex. 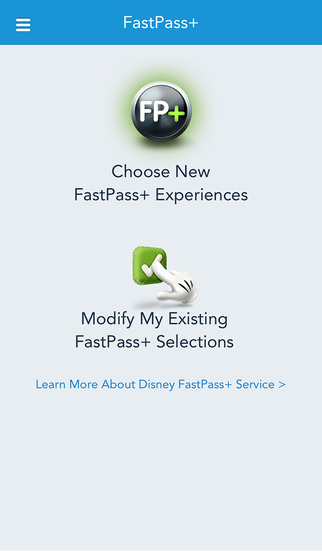 Connecting to the Internet in the parks: Without a strong Internet signal, wait times, park hours and schedules may not update accurately. You can see if your device is connected properly by checking under Settings. Note: Some app features require location data or for you to register by providing your full name, country, birthdate and email address in order to use them. Optional planning tools may also ask you about your travel party or allow you to save a credit card to your profile for online purchases. Now optimized for iPhone 6 and iPhone 6+! 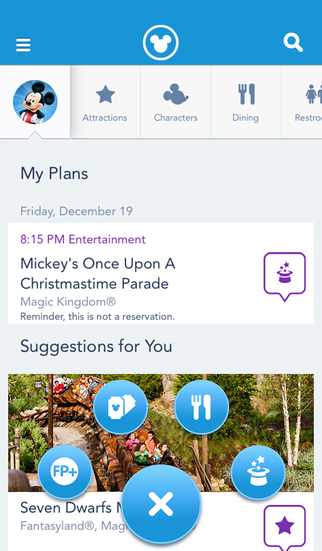 You’ll notice the new “Pull to Refresh” feature for Attraction and Entertainment wait times screens, as well as Character schedules. 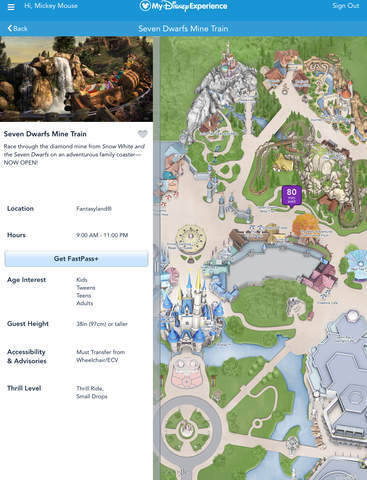 We also updated our park maps, fixed crashes and enhanced overall app performance.